No. 124 Closed Herringbone. I played with different sizes but my favourite is the last, smallest two colour version. Seeing it in my hand it is neat and would make a good border The photo is not so good. I used some DMC, crochet and tatting threads that my DD and myself dyed. No. 125 Beaded Herringbone. Threads are DMC perle– top one does not have much twist to it..
Sharon’s sample looks so neat but I couldn’t do the stitch justice. I tried various ways to cross the beads at the second position from the bottom..No could do. I counted the spaces across and down in Sharon’s sample – still no good so I just played. What I did find that worked, for me, was to lay the beads on the first bar and found they sat in a neater way. I tried this on the second row and also on the last half of the 3rd row. 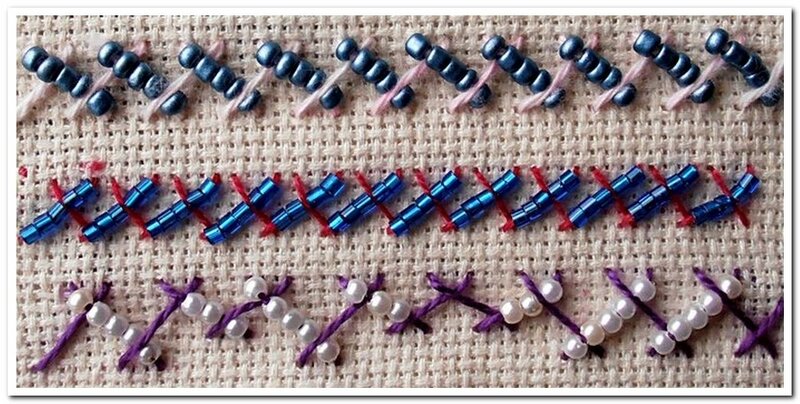 Don’t forget to check out how you can join in learning new stitches here. Sharon freely shares her tutorials and there is no time limit or pressure. 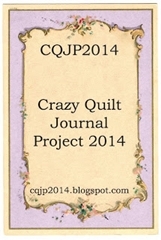 Check out the rest of her blog while you are there. I am working on the 125 right now and am faced with the same problem of how to place the thread over the row of beads. I’ll try your way (middle row). Thanks for giving us an alternative. Fun to see your closed herringbone samples, they look great. Do you remember my Nefertiti? The blue row with blocks is how I stitched the pulled thread at the backside! It looks great with another colour. Thanks for your advice on the beaded herringbone. I hope to stitch that next week, today I just started my closed herringbone stitches! as I had forgotten the pulled work part.